A Casual Clothes Day has been organised for Friday 7th December. This has been organised to raise money to fund the fireworks for our School Community End-Of-Year Celebration Night on Monday 10th December beginning at 6pm. We are looking forward to another big display to finish off our celebrations. If we have enough donations of $2 per student, we may be able to have something extra special on the night. 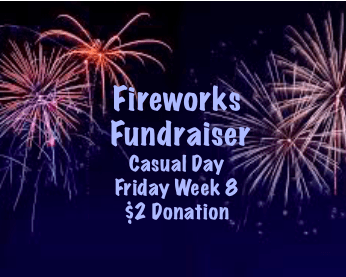 We love the fireworks and each year we try to fund the majority of the cost through our casual day. A Casual Clothes Day means that the students are not required to wear school uniform on that day but can wear casual clothes that are sunsafe, appropriate and comfortable. Thank you for supporting our fireworks funds by donating $2.00. everyone will need to be 50 metres east of the cricket pitch before the fireworks may begin. To do this we will finish our performances and then give everyone 10 minutes to move back away from the cricket pitch … this will take us all back in line with the oval sand play area and the stage. It’s therefore likely people will also be on the basket ball. Do not park in front of the Edward Beck Drive Oval gateway (next to the wavy fence) as we need it clear for access by the fire brigade.